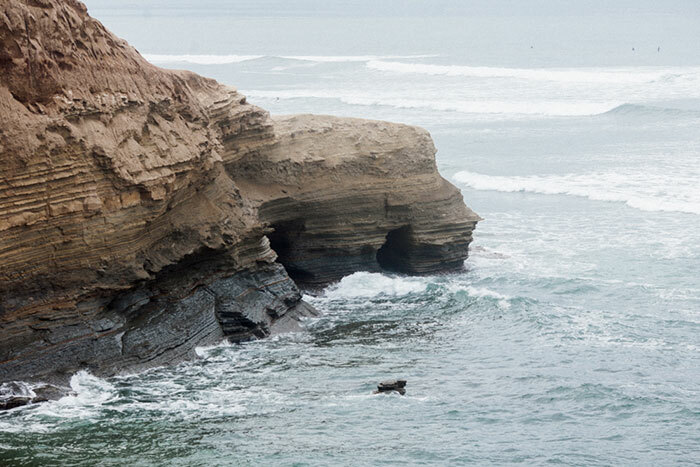 From the shore’s black rock to the golden cliffside, the monumental cliffs in San Diego are positioned perfectly so that in every angle you turn, beauty abounds. 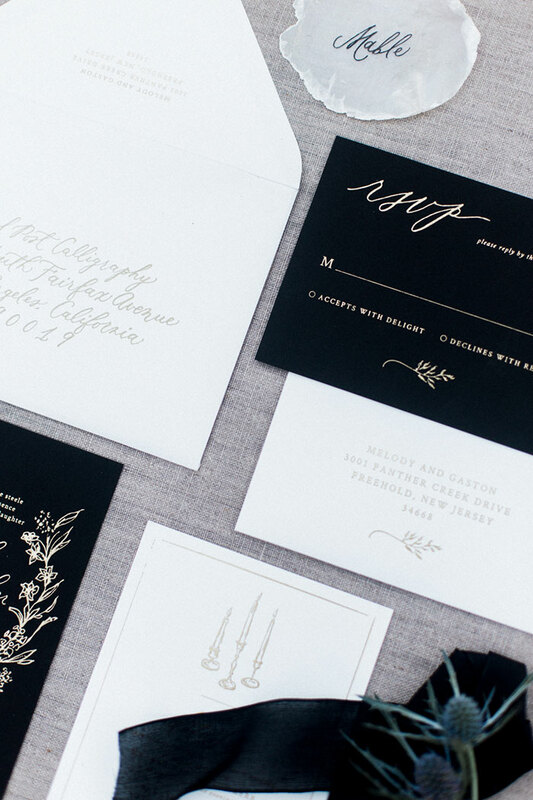 What better place to stage a textural, moody inspiration shoot? 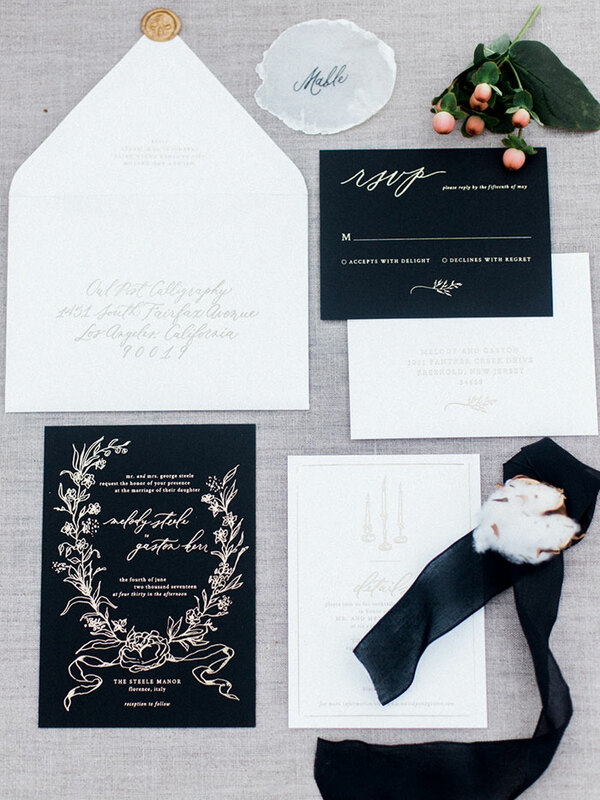 Designed by Michelle Isabel & Co, the textures and breezy details include heirloom calligraphy by Owl Post Calligraphy, florals incorporating elements such as cotton, dried olives and lavender by Sage Sisters and a graphic, ink-dipped cake by Love Cakes. 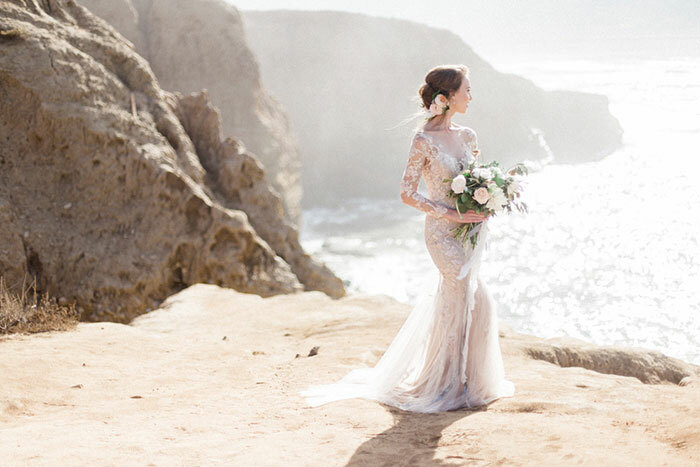 Justin Crtiz Photography was the man behind the lens producing these gorgeous, misty images that will truly transport you. Can you hear the waves?? 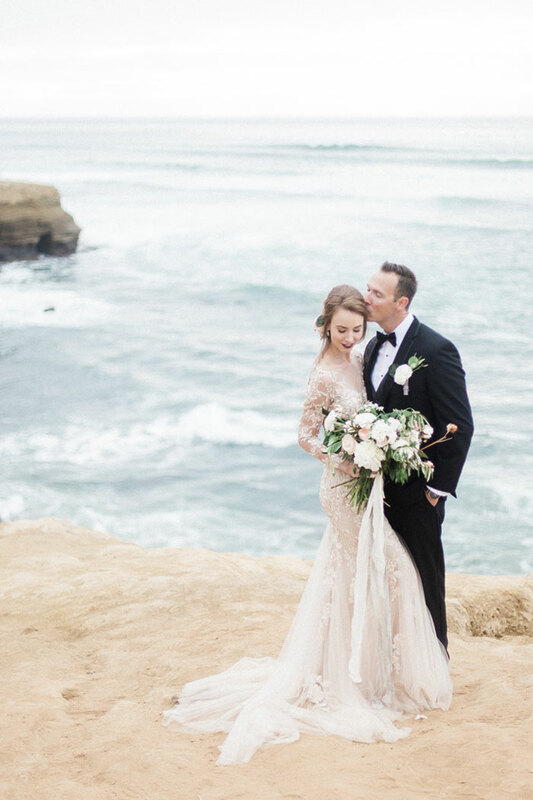 from the team: The Sunset Cliffs were the perfect setting to our winter shoot inspired by that area’s dark waters and the cliffsides golden tones. 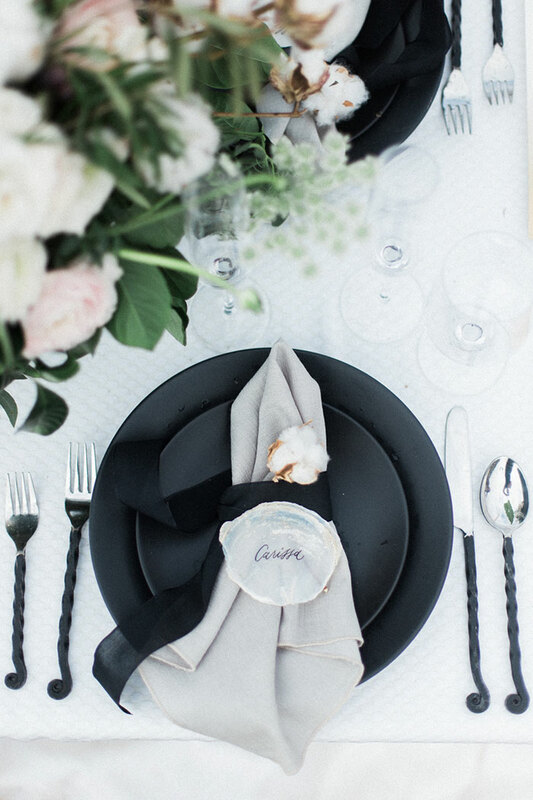 Justin from Justin Critz Photography gracefully captured this Swanky Seaside Soiree using his light and airy photographic style. 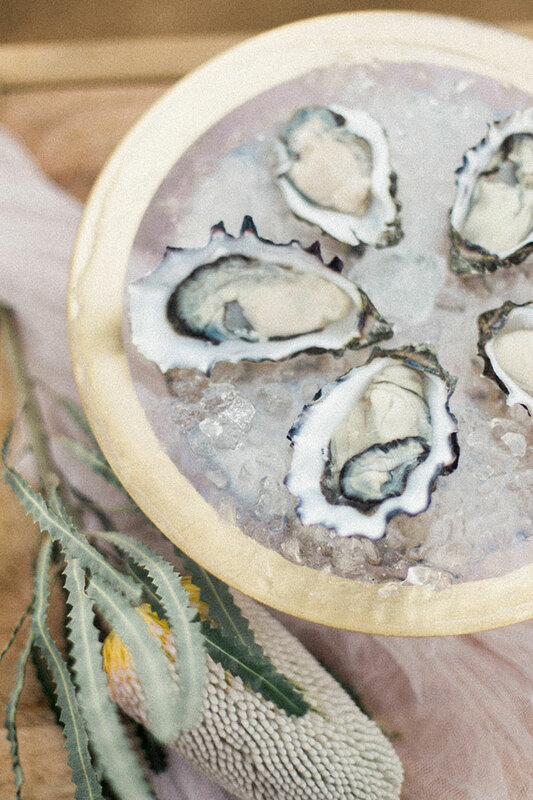 Event Designer and Wedding Planner, Michelle Isabel & Co, designed a tabletop adorned with our world’s oldest and natural resources: ceramic plates, terracotta vessels and twisted iron flatware from Classic Party Rentals graced our tabletop. 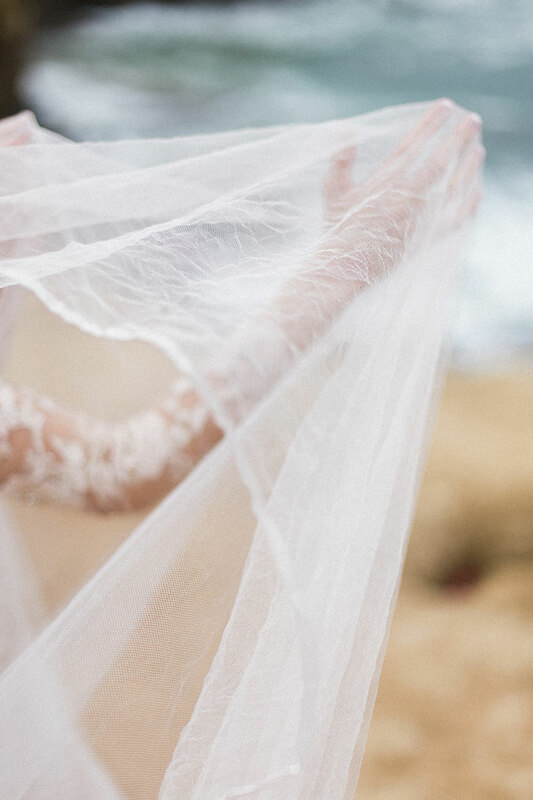 The textured linen was designed by WildFlower Linens with pebble like patterns matching the smooth ocean stones we often see as we stroll the shoreline. 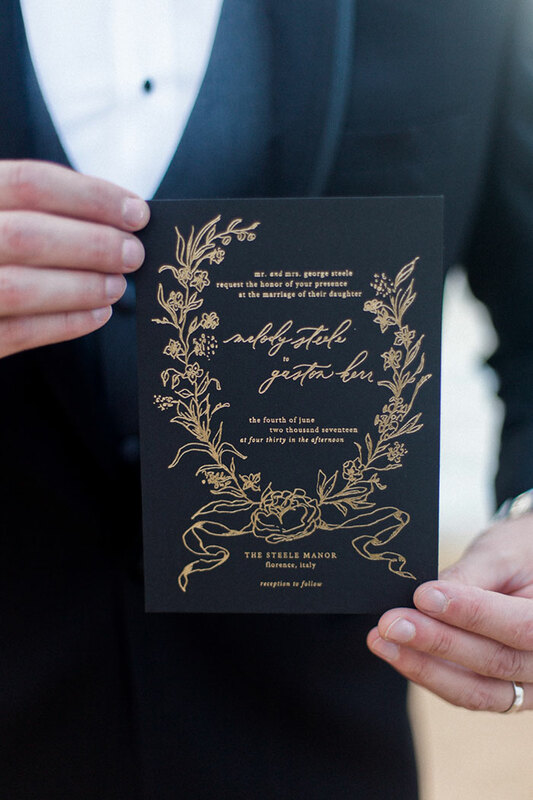 Heirloom calligraphy and design were provided by Owl Post Calligraphy from their Fine Art Collection printed in gold foil on double layered black and eggshell paper. Owl Post Calligraphy also wrote the names in calligraphy on the delicate capiz shell plate. 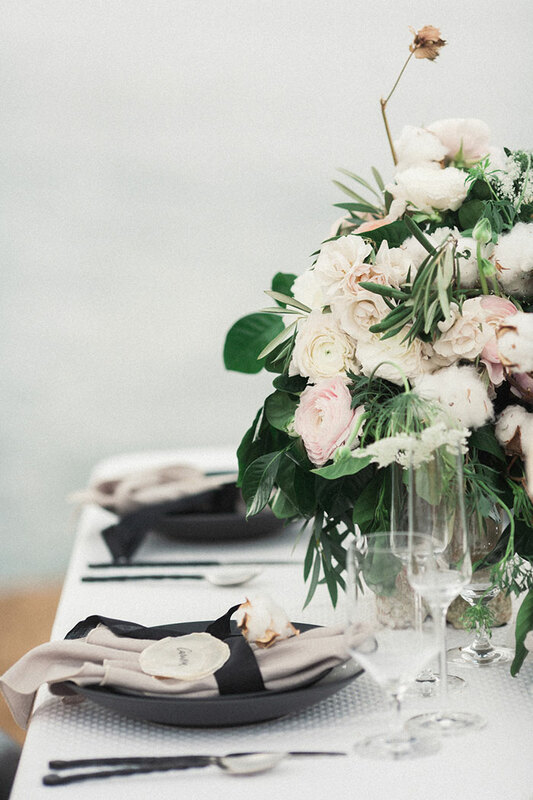 The tabletop was designed by Sage Sisters using everyday elements such as cotton, dried olives and lavender in their natural state, alongside florals that a centerpiece just can’t live without. 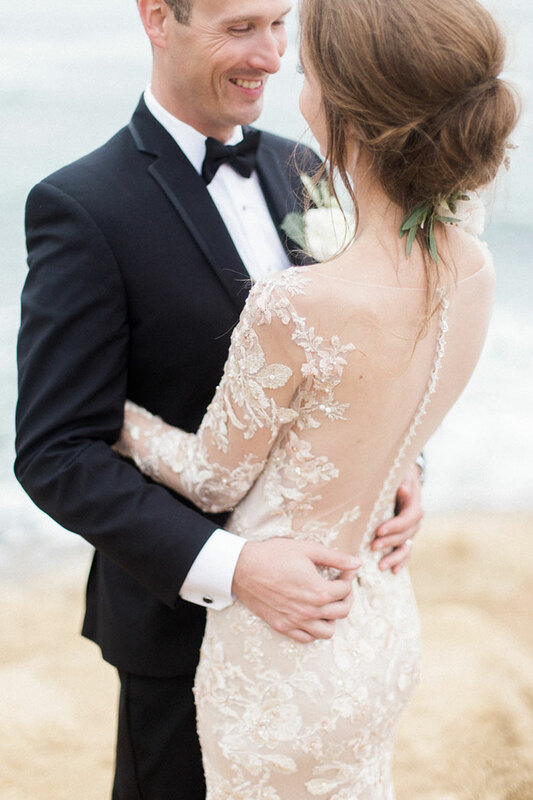 Our real bride-to-be and model, Michelle Van Egmond, was dressed in a La Soie Bridal gown from their Pasadena showroom. 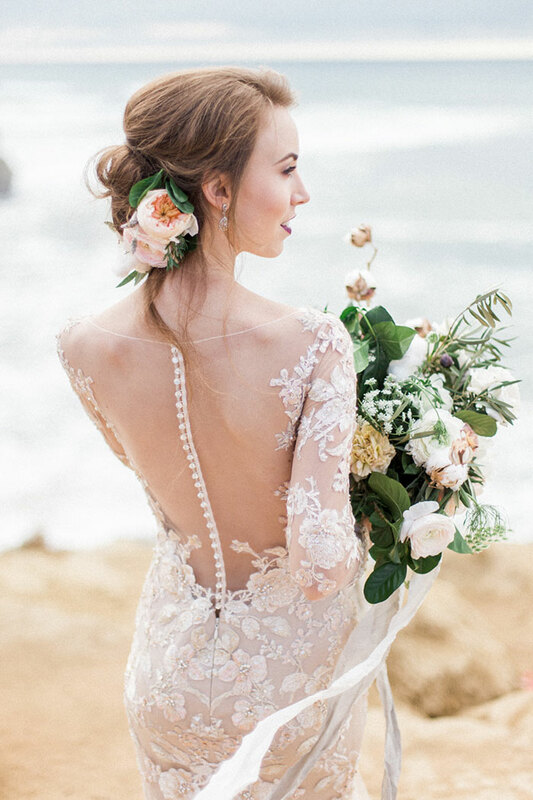 The mocha dress was adorned with blush flowers and the finest beading along with an illusion neckline and a beaded spine. 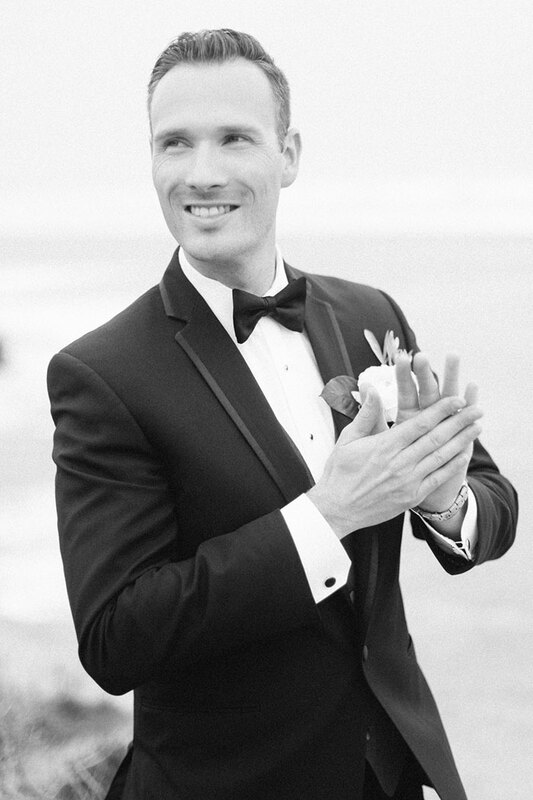 Model and groom-to-be, Jonathan Munn, was fitted in an elegant tuxedo from Friar Tux. 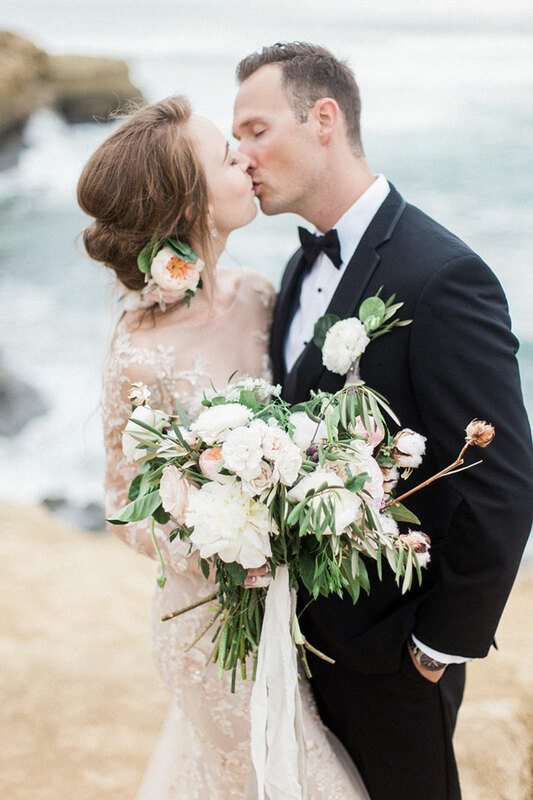 The lovely couple was styled by Hair and Makeup Artist Sandra of Sandra Michelle Artistry. Sandra went with a light and fine look for our bride-to-be’s face and added a dark lip to match the dark tones used throughout the shoot. 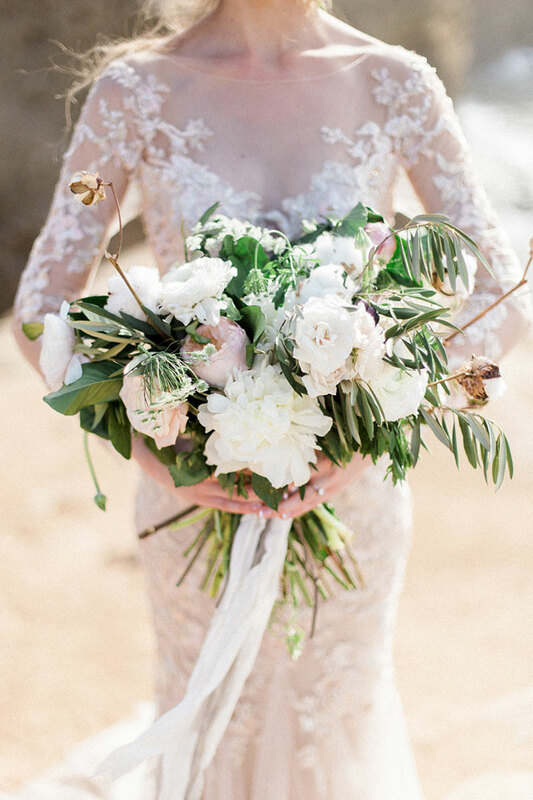 Petals and Stones accessorized our bride with their hand-selected thoughtful collection of accessories. 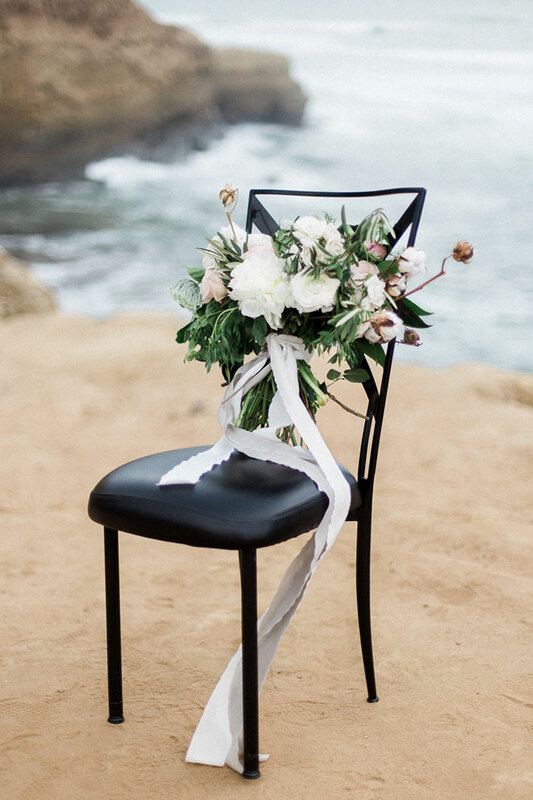 Customized laser cut wooden signs accented our chairs by Jess of Black Label Decor. 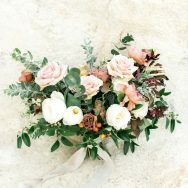 One-of-a-kind event decor was provided by Out of the Dust Rentals providing signature elements that tied in the entire design. The candle our bride-to-be is holding inspired the entire shoot which was one of Out Of The Dust Rentals’ unique pieces. 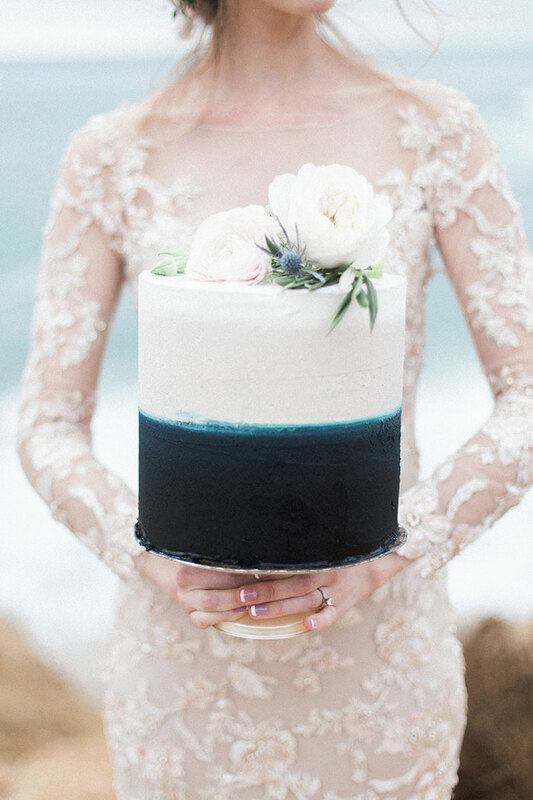 Our pastry chef was Melissa from LoveCakes who designed the sweetest and most eloquent ombre styled cake to match the colors and textures we find at Sunset Cliffs. Last but not least, South Beach Bar and Grille provided raw oysters and shrimp cocktail suited for any seaside gathering. 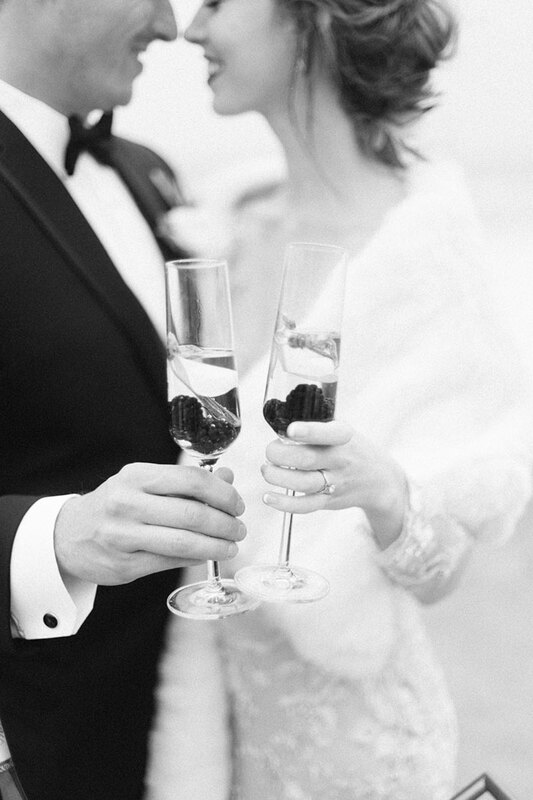 Together as a creative team we were able to expressly celebrate the pure simplicity that is love alone. 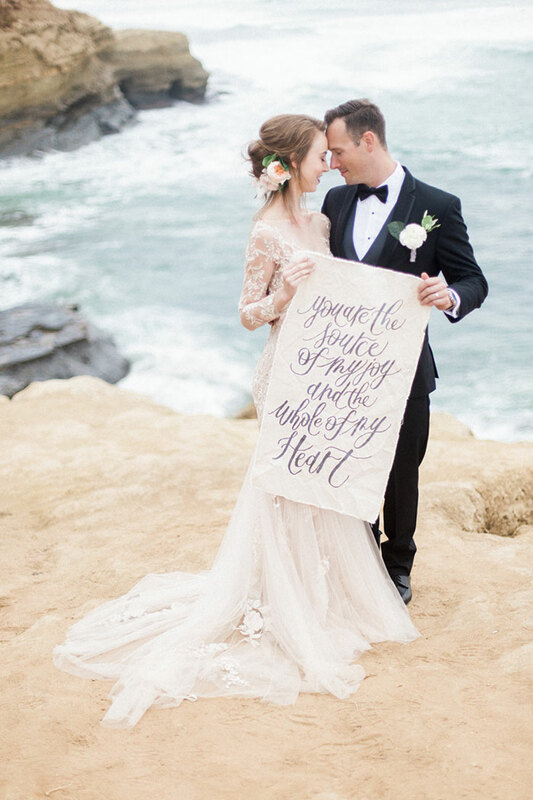 Our bride and groom-to-be have a love for the ocean, fine food and good company. 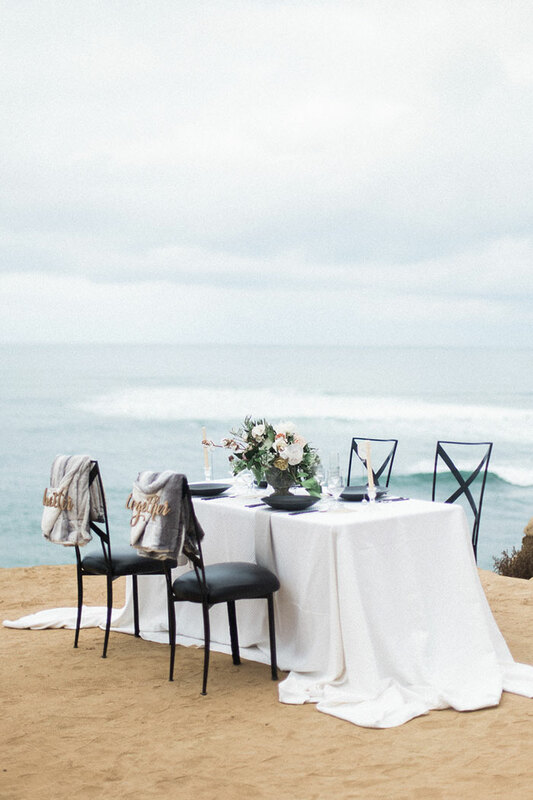 They chose to celebrate their engagement in one of Southern California’s famous sites to display an authentic representation of their union.